Sacker created covers for at least sixteen Alcott titles between 1899 and 1908 or so. The spine designs appear to be identical on many of the titles. 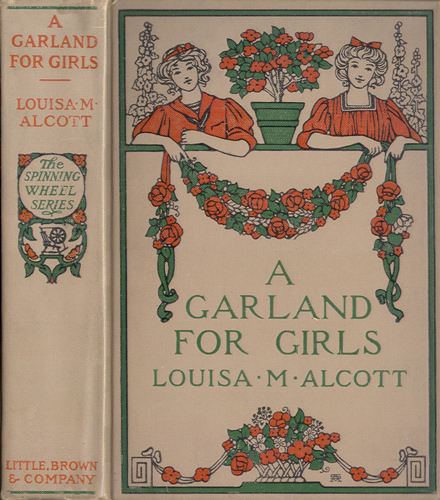 The garland design in the girls' hands is similar to several title-page motifs, such as those for Sense and Sensibility and The Book Plates of Amy Sacker. The lettering used here continued to be used into the 1930's and 1940's! My hearty thanks to Robert Beasecker and the Special Collections unit of the libraries at Grand Valley State University (MI) for this image.